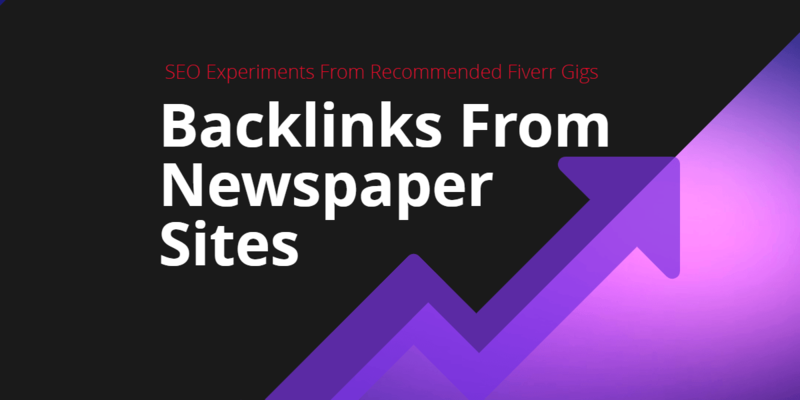 This is a new series of blog posts that I will be doing as and when I get time and we will be focussing on Fiverr and other gig sites for SEO and backlink done-for-you services and gigs and running experiments with them. Now, let me be upfront, I offered this as a bonus for some promotions that I had done a few months back and the first tests were horrible beyond belief and I never did publish them. Those previous experiments were doing tests with some well know DFY services and rather than embarrass them (and me) I decided to take a different approach, map out some strategies and try to find services and gigs to fit. This is so much better on so many levels and there’s a lot more control too. So I have decided to start the series again and we will make blog posts with what the experiments are and the results we will add later after a couple of weeks with some morer data and insights behind a member area. 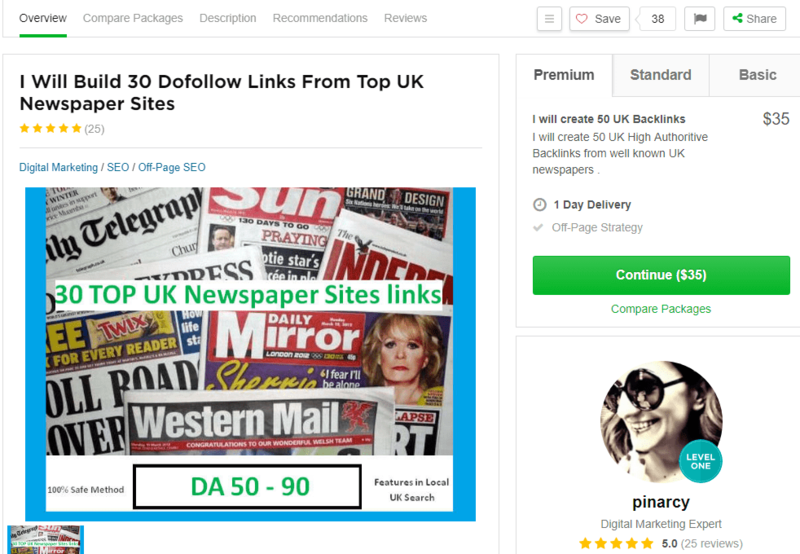 So let’s start with the first Fiverr SEO gig that I recommend and we will test this in two ways which I will explain below. All major Newspapers have authority sites as well as high traffic volumes and many offer directory links for businesses. 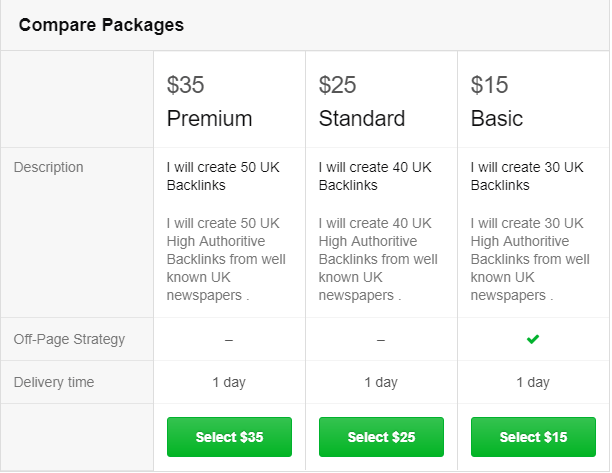 We can get these done on at low cost and get an instant boost to our SEO metrics with just a few links. 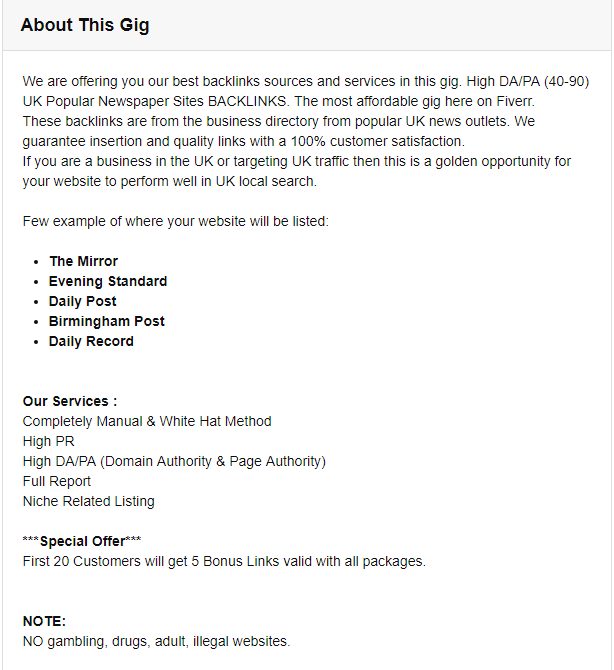 Below you can see the package options of 30 to 50 backlinks from top UK newspaper websites. The seller has 25 reviews, all 5 stars and I have had some discussions with him previously and she is open, helpful and someone I feel that can work with and recommend. What we should expect to see from these SEO experiments? 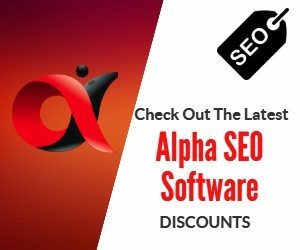 Improved SEO metrics like Trust Flow, Domain Authority etc. Although Majestic, Ahrefs, Serpstat, Moz and SemRush are providing these metrics we have to remember that they are not Google and are providing metrics based on the data that they have to work with. Each one of these platforms has different data, so look on it as a move in the right direction if and when you start to see your SEO metrics improve and nothing more than that. I have to be honest and say that if you are targeting a keyword phrase that's not overly competitive then you should expect to see an improvement on your rankings. As I will be running two experiments with this then we will have two different ways to test this. We may get some traffic from the sites themselves as they are high traffic sites but if you hit page one then you will have the traffic from search engines too. Just make sure you have some marketing elements on your site first such as optin forms, push notifications and retargeting pixels. So here are the two experiments that I will do and I will not mention where I will be linking to until the experiment is over. This way there will be no interference and we can all learn from the tests. In truth that's the purpose of doing these experiments, so that we can discover quick and easy ways to get improved rankings and free organic traffic long term. 50 UK newspaper links to a YouTube video with ONE link in the video description and then we will run a Vid Attack Alpha campaign to the video too. It will take approximately two weeks before we start to see results. I expect that majestic trust flow and citation flow will be the first improvements as we have seen when I did the 301 redirects experiment with our new Expired 301 redirection tool. Traffic and rankings improvements will obviously depend on the keywords being targeted and how competitive those keywords are.